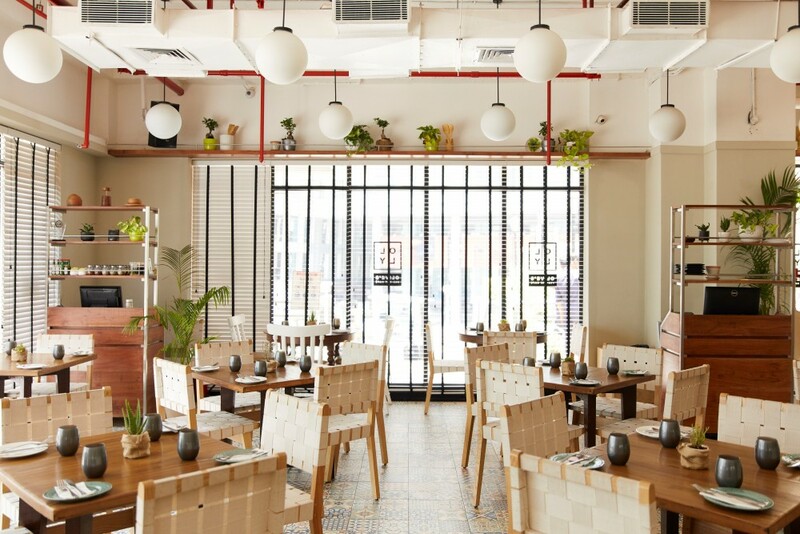 Atmospherics: A large, light filled space with floor to ceiling windows on two sides, Olly is a clean, modern space with indoor plants, books to browse through and a single page menu that has non-fussy, healthy, tasty food that begs to be photographed for Instagram. No: it is not a joke: that really was the brief to the consulting chef who rose to the occasion with admirable success. You can hang out with friends, enjoy a nourishing breakfast before work, spend an hour or two nursing a cold coffee while working on your laptop, or eat lunch or dinner with a glass of wine – Olly is a space that is one of the most pleasant in Cyber Hub, with music played at a comfortable decibel level and non-intrusive service. Table talk: The breakfast sections are the most healthy of all, and with one exception, vegan-compliant too. Most of them could do duty as a dessert. However, it is the small plates offerings that make for fun dining. The big cheese (Rs 375) consisted of a whole burrata dowsed with a few coriander seeds and segments of orange. 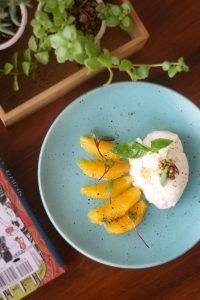 It was light to eat, the honey and rosemary dressing was subtle and added a dimension to the burrata, and the coriander seeds obviously had been macerated beforehand, because their trademark mild flavour was in place, but they were not mealy at all. 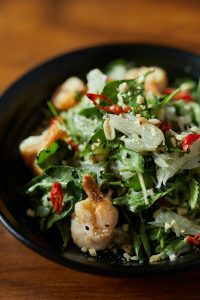 While you would be stretching the truth to call it an Italian preparation, the small plates section did have flavours from Vietnam, Middle East, Thailand, Korea and the Levant. 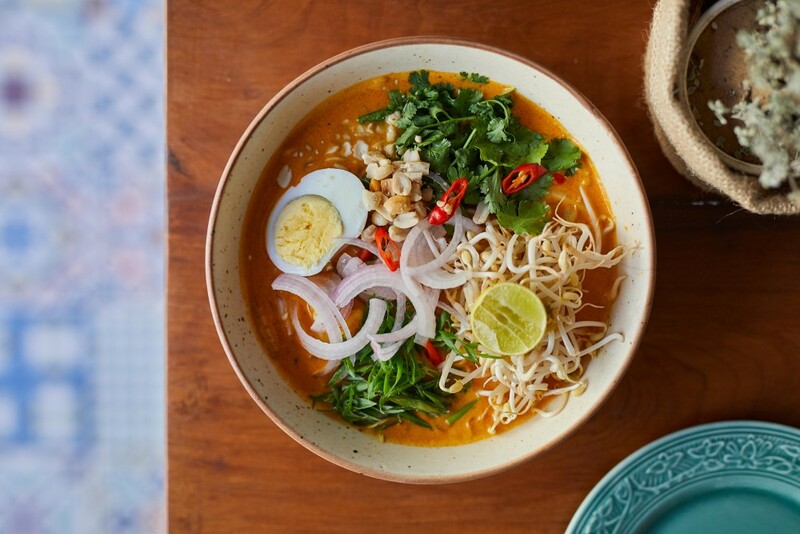 However, Olly is above all, a café and not an ethnic joint, full of traditional dishes: the flavours are meant to appeal to a wide swathe of diners. Sometimes it happens serendipitously that a particular bowl meal so closely approximates the original, that it becomes a sort of signature for diners of that particular country. My Korean fried chicken bowl (Rs 495) did not, on the face of it, appear to be anything more than a distant approximation to the real thing, but apart from the modernized presentation, the distinctive flavour of Korean kochujang was spot on. Plus and minus: the mellow pomelo (Rs 495) was the one disappointment of my meal, with wishy washy colours and flavours, besides too tough greens. Must try: ginger salmon, new school porridge, dip dip.